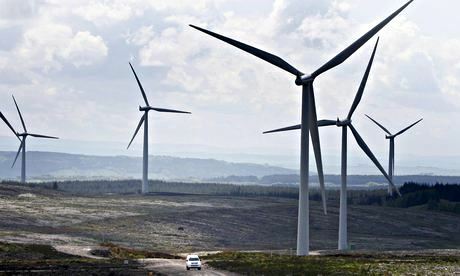 David Cameron's commitment to the green agenda will come under the fiercest scrutiny yet this week when top climate-change experts will warn that only greater use of renewable energy – including windfarms – can prevent a global catastrophe. A report by the world's leading authorities will expose a growing gulf between a Tory party intent on halting construction of more onshore windfarms and the world's leading scientists, who see them as one of the cheapest ways to provide energy while at the same time saving the environment. Mitigation of Climate Change, by the UN's Intergovernmental Panel on Climate Change (IPCC), a panel of 200 scientists, will make it clear that by far the most realistic option for the future is to triple or even quadruple the use of renewable power plants. Only through such decisive action will carbon dioxide levels in the atmosphere be kept below the critical level of 480 parts per million (ppm), before the middle of the century. If levels go beyond this figure, the chances of curtailing global mayhem are poor, they will say. The report – the third in a series by the IPCC designed to highlight the climate crisis now facing the planet – is intended as an urgent wake-up call to nations to commit around 1-2% of GDP in order to replace power plants that burn fossil fuels, the major cause of global warming, with renewable sources. Its conclusions represent a huge challenge for Cameron and the Conservative party – which is now laying plans to block the construction of new onshore windfarms in Britain, the country's only realistic, reasonably priced renewable energy option other than solar power, which has limited potential in the UK. Having promised to lead "the greenest government ever", Cameron now stands accused by the green lobby of watering down his commitments in response to the threat of Ukip, which campaigns heavily against windfarms. The prime minister's green credentials have also been called into question by the appointment in 2012 of Owen Paterson, a climate-change sceptic, as environment secretary. Paterson said in September 2013: "People get very emotional about this subject and I think we should just accept that the climate has been changing for centuries." An Opinium/Observer poll – which today puts Ukip on 18% support – also finds that just 15% of voters think Cameron has lived up to his promises on the environment, against 46% who think he has not. 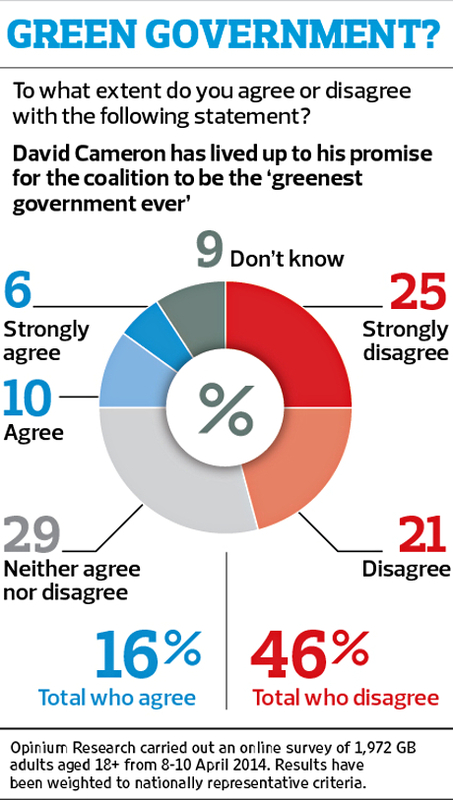 In addition, only 20% disagreed with the suggestion that the government was giving priority to short-term economic growth over the sustainable use of the environment. Last week local government secretary Eric Pickles announced he had taken personal control over all future decisions about new onshorewindfarms, while Grant Shapps, the Conservative party chairman, said wind turbines were no longer "environmentally friendly". Shapps also suggested that the Tories would pledge to curb them in their 2015 election manifesto and instead approve only offshore windfarms. However, the move would cripple the ability of the government to play a full part in curtailing carbon dioxide emissions, and experts warn it could lead to higher energy prices. Onshore wind power costs around £90 per megawatt hour to generate, but for offshore windfarms this rises to £150. Other renewable energy sources are either of limited use in Britain or are not yet fully developed, such as tidal power. Nuclear energy is one alternative, but is controversial, and a major construction programme would take decades to approve and construct. "Renewable energy is backed by the public; wind power has the support of two thirds (66%) of Britons and the CBI has called on action to tackle climate change," said Christian Aid's senior climate change advisor, Mohamed Adow. "The government should be doing all it can to put the UK at the forefront of this energy revolution not blowing hot and cold on the issue. Joss Garman, Greenpeace's deputy political director, said: "These scientists have shown us that it's not too late and we can still avoid the worst impacts of climate change, but only if we get behind the clean energy solutions that can slash carbon pollution. Renewable energy technologies are already the least-cost option in a growing number of major markets, and they're getting cheaper all the time.Rather than turning back towards dirty fuels like coal and gas, now is the time for Ministers to double down on our transition towards a cleaner energy system. This report shows that the sooner we act, the cheaper it will be." The new report has taken four years to compile. It is expected to say the UN target – to limit global warming to 2 degrees celsius (3.6 degrees fahrenheit) – is feasible only if surging carbon emissions are swiftly braked and then reversed. The first report forecast that global temperatures would rise by 0.3-4.8C this century, on top of roughly 0.7C since the industrial revolution. Seas are forecast to rise by 26-82cm by 2100. The second report, which was issued last month, dwelt on the likely impacts and warned that the risk of conflict, hunger, floods and mass displacement increased with every minuscule rise in temperature. The panel will issue a résumé of all three reports in Copenhagen in October, prior to the next major UN climate summit, which is scheduled to open in Paris in December 2015. The last IPCC assessment report, published in 2007, formed the core of the international debate on climate at the UN's Copenhagen Summit in 2009. The event degenerated into a political brawl and climate negotiations have been stuttering ever since. Climate experts say this failure to act cannot be allowed to continue. UN members must agree to a climate pact that will come into force in 2020. Any later and the costs of mitigating climate change will soar exponentially because there will then be so much carbon dioxide in the atmosphere. UK economist Sir Nicholas Stern said: "All political leaders should recognise that a powerful case has been presented for accelerating action against climate change by building cleaner and more efficient economies. "Dr Stephan Singer, WWF director of global energy policy, added: "Renewable energy can no longer be considered a niche market. Renewables must – and should – eventually take the full share of the global energy market within the next few decades."